The ADATA SE730 is the most interesting of the three SSDs, with its compact form factor and a USB 3.1 Gen 2 Type-C interface. The host interface ensures that the claimed performance numbers are as good as what one would get with a high-performance SATA SSD. In addition, ADATA also claims IP68 qualification (totally protected from dust ingress as well as long term immersion in water) for the unit. The SE730 also carries a MIL-STD-810G - 516.6 shock-proofing certification. 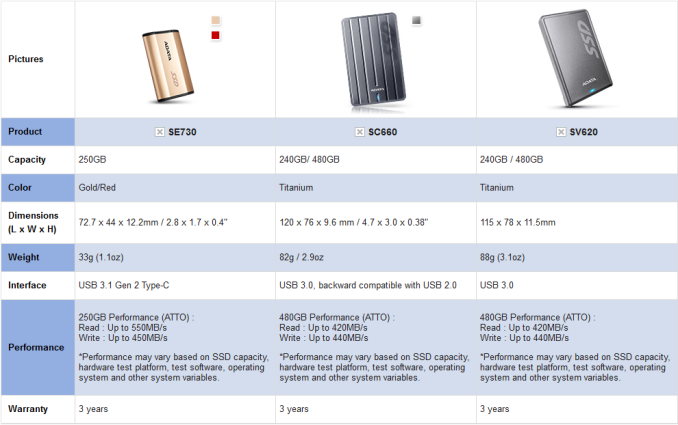 On the other hand, the SC660 and SV620 are being introduced into the market as affordable external SSD options. These have the same form factor as a thin 2.5" SATA drive, except that the units carry a USB 3.0 Micro-B interface at one end. ADATA provides a helpful comparison table for the three products, and it is reproduced below. Despite sporting a Type-C interface, the ADATA SE730 is bundled with a Type-C to Type-A cable only. This is not a problem, as consumers can also use their own Type-C to Type-C cable. Given that Type-A ports are more prevalent right now, we are not going to complain about ADATA's cable bundling choice for the device. The SV620 and SC660 both bundle a USB 3.0 Micro-B to Type-A cable. All three devices are bus-powered. From the above table, it appears likely that the SV620 and SC660 carry the same internal drive and only differ in the external casing. Prior to getting into the internal details, it must be noted that the SE730 250GB has a street price of $120, while the SV620 480GB version comes in at $135. ADATA supplied us the SC660 240GB version for this review, and that has a street price of $90. CrystalDiskInfo provides us some insights into the internals of the units without having to open them up. The SE730 registers as the ADATA SE730 - a SATA drive behind a USB bridge that supports UASP. Unfortunately, the ADATA SE730 doesn't correspond to any publicly available SATA SSD from ADATA. The SV620 and SC660 both register as the ADATA SP550, which corresponds to the Premier SP550 TLC SSD that we reviewed earlier this year. However, the bridge controller used in these three devices is not immediately evident. However, the amount of SMART data gathered from the SV620 and SC660 are different - pointing to either firmware differences in the SSD itself, or in the bridge chip. In order to learn more about the devices, we have no option but to pry open the units. Doing so reveals that the SE730 uses the VIA Labs VL716 bridge chip. This is the same as the one used in the Satechi USB 3.1 Gen 2 Type-C 2.5" enclosure reviewed in September. The SSD itself seems to be a M.2 2242 SATA one. It is good to see a thermal pad (on top of the controller) that maintains contact with the metal body. Peeling apart the label on top of the M.2 SSD reveals the JMicron JMF670H SSD controller. This is the same as the one in the ADATA XPG SX930 SATA SSDs launched towards the middle of last year. A single DRAM package (Nanya) and two flash packages (packaged by ADATA themselves) make up the rest of the SSD. The JMF670H supports MLC (no TLC), and this gives us an indication that the flash packaged by ADATA ought to be MLC. The SV620 and SV660 both use the Premier SP550 SATA SSD as-is inside the chassis (as the gallery below shows). A look at the board connected to the SSD shows that the JMS567 SATA-USB 3.0 bridge (PDF) is used in both, though the part's package numbers are slightly different. The SC660 is slightly longer than the SV620. It uses a horizontally laid out board (relative to the male SATA and micro-USB ports). The SV620, on the other hand, uses a thin vertical board. The gallery below shows the internals of both the SV620 and the SC660. In the rest of the review, we will take a look at the testbed setup and evaluation methodology, as well as the performance numbers. Following this, we take a look at the performance consistency, power consumption and thermal characteristics. In the final section, we will take a look at TRIM support before concluding with a look at the pricing compared to other similar products in the market.